Artist Point at the Wilderness Lodge. Disney World veterans know that there’s more to life than burgers and hot dogs while at the World. 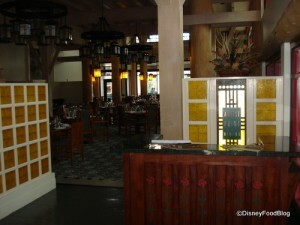 Fine cuisine can be found all around the theme parks and resorts. So here’s a primer on the crème de la crème of Disney World cuisine. All listed below are 2 table service credits on the Disney Dining Plan, unless otherwise noted. Artist Point, located in the Wilderness Lodge. Evoking the tastes and feel of the Pacific Northwest. Famous for its seasonal Copper River salmon. Bistro de Paris, located in Epcot’s World Showcase. (Not available on the Disney Dining Plan.) Authentic French cuisine — the brainchild of three of France’s most decorated chefs: Paul Bocuse, Roger Verge, and the late Gaston Lenotre. California Grill, located in the Contemporary Resort. Located atop the Contemporary Resort with a spectacular view of Magic Kingdom fireworks, the menu changes often and gets great reviews. Citrico’s, located in the Grand Floridian Resort. Fresh, upscale American dining. Great steaks, seafood, and famous for its Tropical Fruit Creme Brulee. Flying Fish Cafe, located in the Boardwalk Inn. Seafood is the name of the game here. It has a fresh, whimsical, carnival-like atmosphere. Hollywood Brown Derby, located in Hollywood Studios. A replica of the famous Hollywood landmark, the food here is top-notch. Famous for its Cobb Salad and Grapefruit Cake. Jiko, located in Animal Kingdom Lodge. A highly acclaimed taste of Africa, with an extensive South African wine list. The signature entree: Oak-Fired Filet Mignon with Macaroni and Cheese and Red Wine Sauce. Canada’s Le Cellier Steakhouse, located in Epcot World Showcase (2 credits for dinner starting March 2011, 1 credit for lunch). It’s almost impossible to get a reservation here, so book early. Famous for its bread service, Canadian cheddar cheese soup, steaks, and maple creme brulee. Narcoossee’s, located in the Grand Floridian Resort. Upscale, but casual, located on the Seven Seas Lagoon with an excellent view of fireworks and the Electric Water Pageant. Surf and turf is the name of the game. Victoria and Albert’s, located in the Grand Floridian Resort. (Not available on Disney Dining Plan). The most critically acclaimed restaurant in Florida, with a AAA five-diamond rating. This is the place for a truly special meal experience. Yachtsman Steakhouse, located in the Yacht Club Resort. Known for its hand-cut steaks, this is the place to go for meat lovers. This entry was posted on Saturday, October 2nd, 2010 at 8:50 pm	and is filed under Dining, Planning, Theme Parks. You can follow any responses to this entry through the RSS 2.0 feed. You can leave a response, or trackback from your own site.